I was booked into step class this morning as I wanted to make sure me knees (still not 100%, but still a total improvement to 2 weeks ago – plus my physio had advised I keep going if there’s no pain) had plenty of rest for my ‘planned’ long slow run tomorrow, but ended up cancelling my booking and hitting parkrun again. I say ‘planned’ (in regards to my long run) as it’s my birthday weekend (birthday is on Monday but doing stuff with friends tonight), so my run depends largely on my behavior tonight. My longest run this year has been nearly 8.5 miles, so I wanted a minimum of 9 (but hopefully 10) tomorrow. I have a friend who might come with me, but again, depends on how he feels. Plus a 10k is the most he has run in his life, but he’s come far in the month or two that he has been taking running a bit more seriously. Anyway, the two of us ended up at parkrun this morning before Body Pump. It was cold, but dry and there wasn’t really any wind. Perfection! We both smashed our last parkrun attempts, coming in at 25:08 (me) and 25:09 (Grant). A wee bit to go before I’m pulling in sub-23’s again, but slow improvements, so I’m pleased. 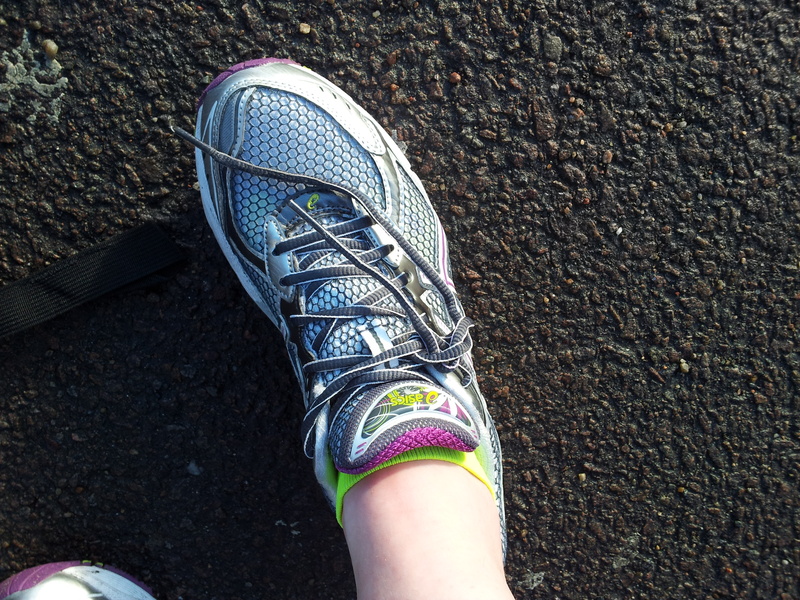 I was especially thrilled at my time as about 100 metres into the run I realized that my shoelaces had come undone on my right trainer. But, like a champ, I willed myself to ignore it and only stop of it became totally unmanageable to run in (it very nearly did). Three weeks to go before my first ever 10 mile race (which is why I’d like to have confidence that I can run that distance after this weekend) and four weeks until my first half marathon. It’s right about now that I’m thinking: you total spoon, what were you thinking? 10k is your distance, woman! But then I push those thoughts to the back of my mind and think of beer. Thinking of beer gets me through some pretty tough situations. This entry was posted in parkrun, Running, Training and tagged 10 mile, 5k, aberdeen, half marathon, parkrun, running, untied shoelaces by MedalSlut. Bookmark the permalink. Good luck in your half marathon! I ran my first in October and it wasn’t nearly as bad as I was thinking it would be. And yes, beer can help will the mind through a lot. Happy birthday! Thanks! Birthday isn’t ’til Monday but was out for beer and Mexican food last night. 🙂 It’s reassuring to hear your half wasn’t too bad. Just managed my longest ‘long run’ yet, so feeling a bit more confident!